Previously known as a peasant food, polenta is now a premium product and is even served in high-end restaurants. Polenta is most commonly made using ground cornmeal, and is ground coarse or fine, depending on the preference of the region. It is most popular among the Northern Italians, where polenta is a household must. Polenta is a slowly cooked dish that commonly takes almost an hour to cook, stirring often. It is served creamy, or set, as in the picture above. Now a days, it is common to see pre-cooked polenta tubes sold at your local grocer for around $4 for an 18 ounce tube. I have even purchased it at Wal-mart, so it shouldn’t be hard to find. I enjoy eating polenta along side my salmon with veggies, or with a nice topping of meat and vegetables. It is also great, because it is gluten free! 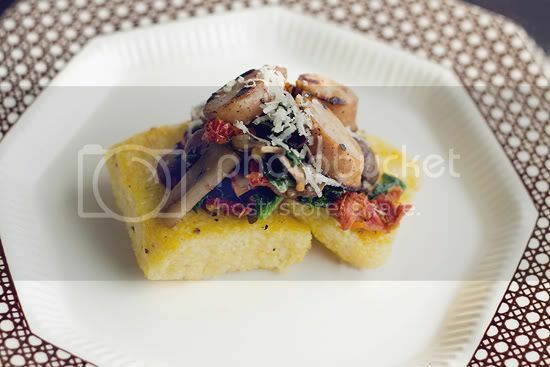 Here is a great recipe for Polenta with kale, mushrooms, sun dried tomatoes. Click here. I added sliced Chicken Sausage, and red pepper flakes to the recipe, and it turned out great! Now, to make your own polenta. I suggest giving it a try. You’ll save money, and there is always something about making things at home. You can control exactly what is going into it. Put 6 cups cold water, the salt, and bay leaf into a Dutch oven or a heavy stockpot, and bring to a boil. Bring remaining 4 cups cold water to a simmer in a small saucepan over medium heat. Add polenta to large pot in handfuls, separating your fingers to let the grains slip through and whisking constantly until combined. Reduce heat until only a couple of large bubbles appear at a time. If not serving immediately, reduce heat to lowest setting, cover pot, and keep warm until ready to serve (up to 1 hour). Remove bay leaf. Season with pepper. For soft polenta only: Stir in butter. Use a damp spoon to serve. Top each serving with Parmigiano-Reggiano. For set polenta only: Pour into a slightly damp or a 13-by-9-inch baking dish. Let stand until no longer steaming, about 10 minutes. Refrigerate, uncovered, until cold and set, about 1 1/2 hours. Cover with plastic wrap. Refrigerate until ready to serve (up to 2 days). Turn out polenta. Using plain dental floss, cut horizontally in half, pulling string toward you. Cut in half crosswise, pressing string downward. Cut each half lengthwise into 1 1/2-inch-wide strips, cut strips crosswise into thirds, and then into triangles or squares if desired. Alternatively, cut polenta with a knife. this looks so yummy! i totally want to try it out! Thanks for providing your nice information. I like your site!! I invite you to take a tour on my herdreamdiamond website for more details. this looks yummy, i've never tried polenta so this might be a good time to try. Do you have a recipe for the chicken sausage with vegetables ?